save me, oh font of mercy!" Prime Minister Abe Shinzo is in Paris today, a participant in the mass gathering of world leaders for the COP 21. The good and the mighty will come together, maybe, to map out the next step in our saving of ourselves from the consequences of our lifestyles and organizations, at least as far as climate change goes. 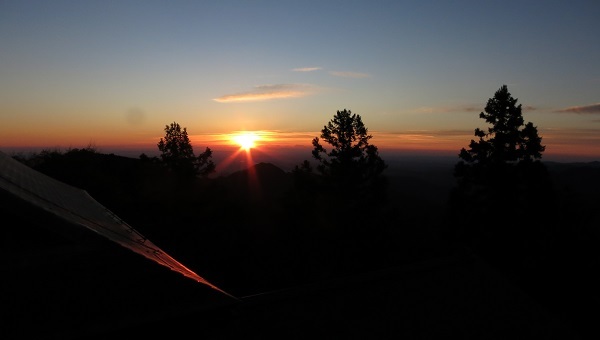 While Mr. Abe is likely to be still asleep at this hour, a brilliant morning awaits him politically. The latest Kyodo News poll is out and it is a stunner for the PM and his allies. First is the baseline Cabinet support number. 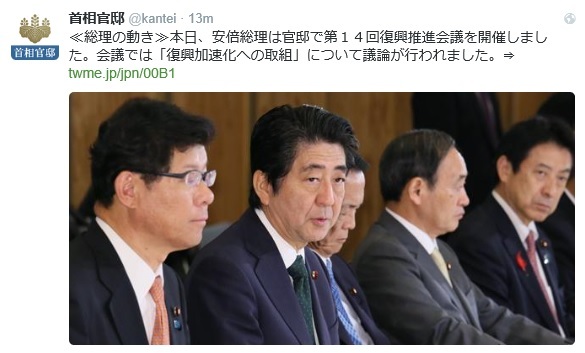 It has risen a solid 3.5 points, continuing the Abe Cabinet's popularity's steady climb out its August nadir. Support for the Abe Cabinet now stands at 48.3% of all respondents, with 40.2% of respondents not supporting (down 0.8% from last month). Only 11% of the voters remain on the sidelines (down 2.7% since last month). Q: Do you support the Abe Cabinet? Asked the reason why they support the Cabinet, a staggering 36.5% of the respondents now say it is because "There is no other appropriate person but Abe Shinzo." This represents a rise in this figure of 8.4 points over a single month. At no time in recent memory has such a large fraction of the electorate enthusiastically/resignedly seen no alternative to the current leader. 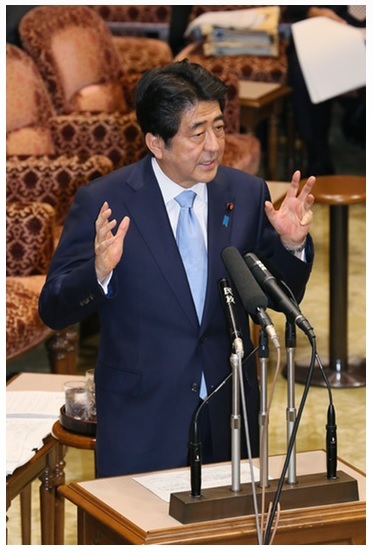 Emphasizing the "One Abe to Rule Them All" theme was the movement in favor of the Liberal Democratic Party over this last month -- which is there was no such movement. Here are the support figures for the parties, both from the survey over this weekend and the one conducted October 7-8 (in parenthesis). Osaka Ishin, fresh off its triple victory in the prefectural, mayoral and assembly elections on November 22, has siphoned off the support from the rump Innovation Party (no surprise here) and some further votes from...somewhere else (time will tell). While it has been tempting to write off Osaka Ishin as a minor regional force, with no hope of a national reach anytime soon, attracting 4.4% support in a national poll should shake up some quarters as it surpasses the support for the indubitably national Communist and Komeito parties. The DPJ secretariat should also be breathing a sigh of relief today, as the poll shows that the bitter and pointless attempt by DPJ conservatives to unseat the moderate party leadership, revealing the ideological divisions within the main opposition party, has not cost the party much of its support. Yet. In addition to basking in the glow of a near 50% approval rating that is his alone, Abe Shinzo will likely be beaming from the results of the last question of the survey. The responses seemingly refute the concept that Japanese voters are risk-averse when it comes to deploying the Self Defense Forces. 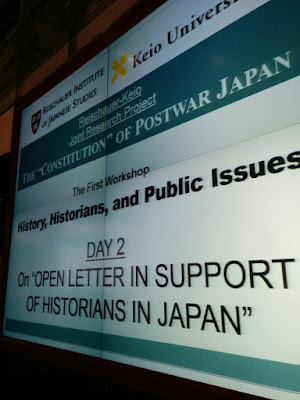 Q: Do you agree with or oppose the dispatch of the Self Defense Forces to the South China Sea to engage in 'cautionary surveillance' (keikai kanshi) of China's building of artificial islands?" If you had told me yesterday 52% of Japanese voters are ready and willing to send the SDF into a confrontation with China, I would have thought you daft. Today I obviously would not think you daft...but I am not convinced the Japan normalization partisans should be toasting each other in victory. A telephone poll by definition does not have the respondents looking at a map. For those on the main islands of Japan, the difference between the East China Sea and the South China Sea could be kind of fuzzy. The Senkakus and the Spratlys are both in "the south" at least as seen from everywhere in Japan except Okinawa, and there both in a "China Sea" of a sorts. Asking the voters would they be willing "to have the SDF sailing in between increasingly militarized artificial islands lying in between the Philippines and China" might have generated a different percentage of approving respondents. Image: Sunrise from atop Mitake-san, looking toward Yokohama and the Chiba Peninsula. Ome City, Tokyo Metropolitan District, 28 November 2015. It is a rare foggy morning here, appropriate weather for the release of the interim plan for the "Dynamic Engagement of All Citizens" - the Abe government's grab bag of proposals to meet its New Three Arrows goals. Whether this text is the Request from the Liberal Democratic Party regarding an "Urgent Proposal for Realizing the Dynamic Engagement of All Citizens" (Link); the proposal from the Komeito on "Realizing a Society in which Every Single Person Can Shine and Play an Active Role"(Link); a conflation of the Request and the Proposal; or none of the above, I do not know. The Kantei text seems to be a flash-translation with little-to-no input from any native speakers of English. The result is an excruciating to the point of being humorous ("Dream-Weaving Childcare"? Somebody call Gary Wright, he has a theme song to sell) read. Of course, the clumsy English could be part of a Sirius Cybernetics strategy, where the superficial deficiencies of the language mask the deep and fundamental deficiencies in the thinking. The busy might want to skip to the last page of the ostensibly brief (19 page) plan. Here on a single slide is the whole report, in what wags might call inimical Japanese Powerpoint style. I have on-gain/off-again Twitter wars with the opinionated Professor Noah Smith of Stony Brook University on subjects Japanese. In a recent exchange I lost patience with the good doctor, for which I am only slightly sorry. In the economics explanation women have fewer children based upon calculations marginal utility and opportunity cost. 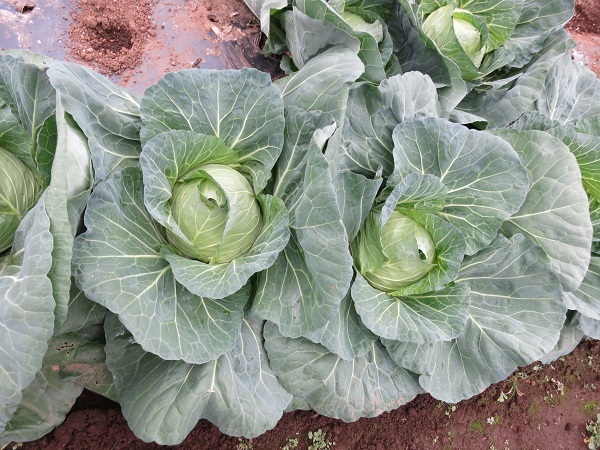 While in agricultural societies children represent potential increases in labor force and output, in industrial and post-industrial societies children represent zero increase in output. Furthermore, for the woman in developed societies the birth of each child represents an economic subtraction, time and energy that could have been spent furthering their careers or increasing their take-home pay. In Japan's case, however, declines in fertility preceded and exceeded possibilities of tradeoff between work and childbirth. Hence my answer -- that in East Asia behavioral effects of calculations of marginal utility and opportunity cost are small compared to the effects on fertility of later marriage and the social stigma/economic catastrophe of out-of-wedlock birth. In contradistinction to the economic explanation, married women in Japan are having children at the same rate they always have -- lost economic opportunity turns out to be a feeble predictor of Japanese fertility. The policy implications of this for the second of the Abe Administration's New Three Arrows -- raising the number of births from 1.4 per woman to 1.8 -- are clear. More day care, including day care centers inside corporate buildings (Link- J)? Largely irrelevant for fertility. Relevant for the workforce participation rate? Sure, flattening the infamous "M Curve" (Link). But largely irrelevant for fertility. 1) Convince Japanese to marry in their early twenties like they did in the 1970s. 2) Eliminate the social stigma and economic consequences of out-of-wedlock birth. 4) A combination of all three. Good luck with the above. But don't take my word for it. Check out the amazing slide presentation of Saito Jun of the Japan Center for Economic Research on Japan's capacity to overcome its lower fertility and shrinking population (Link). The whole (expletive deleted) argument over Japan's demographic limits to growth is laid out in detail. Those with a little more time can check out the Tokyo on Fire videos for discussions of these matters. Like this one perhaps. Not terribly much. At least not on a national scale. While the candidates of Hashimoto Toru's and Matsui Ichiro's start up party were able to seize both posts over united establishment rivals, keeping alive Hashimoto's pet project of transforming Osaka into a metropolitan district (the merits of which no one has yet been able to explain to me) the caveats to the victories are many. 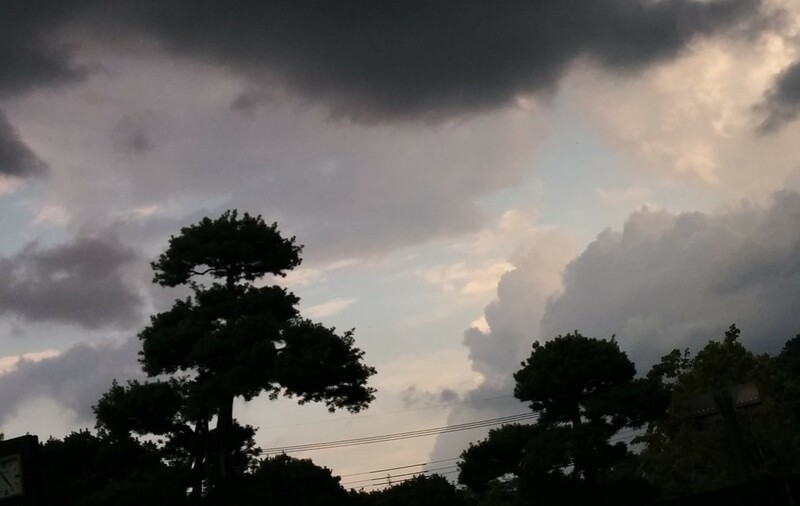 Second was the ambivalent position of the Abe Administration toward Osaka's political actors. Despite their immense difference in backgrounds, Prime Minister Abe and Hashimoto have long seen each other in a common cause. Hashimoto indeed asked Abe four years ago to leave the Liberal Democratic Party and become leader of his first upstart national party. Abe and Chief Cabinet Secretary Suga Yoshihide have been very solicitous of Hashimoto, making time in their schedules to meet with him and saying nice things about him at every invitation. The close political cooperative relationship between Abe and Hashimoto has engineered a complete breakdown in coordination and trust between the Osaka chapters of the LDP and the national LDP headquarters. The LDP in Osaka ran its own candidates in the double election, asking for and receiving electoral support from blood rivals the Democratic Party of Japan and the Japan Communist Party. The election also caused a minor split between national allies the LDP and Komeito, with the Osaka Komeito chapter releasing its supporters to vote for whomever they wished. Third, even with their victories in the executive branch posts, the Osaka Ishin no Kai still lacks enough seats in the prefectural and municipal assemblies to initiate the metro area plan. Osaka Ishin no Kai will still need cooperation from another party, ostensibly the Komeito since they are the enemies of just about everybody else. Fourth, even with this victory, the Osaka Ishin no Kai is still only the rump of the rump of the national party Hashimoto co-led to an astonishing second-place finish in the proportional vote of the House of Representatives election of 2012. Independents spin-offs of the national party still remain in other parts of the country, some clinging to the Ishin brand name while clinging also to a significant amount of Hashimoto's cash in their bank accounts. Hashimoto is going to be fighting for that money -- to the detriment of his political mission and the forward progress of his regionalist movement. Tactically, Prime Minister Abe's embrace of Hashimoto seems a disaster. He has made enemies of the LDP establishment in Osaka, Japan's second city. 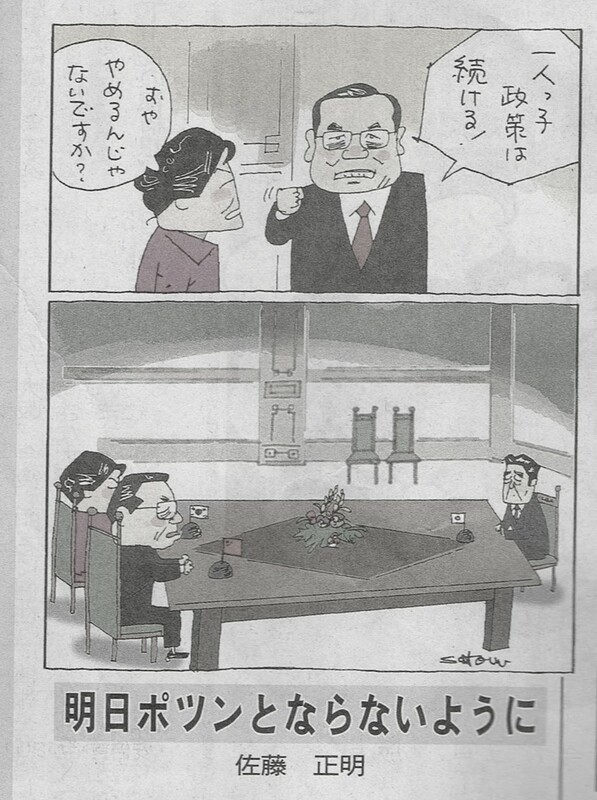 Strategically, however, Abe's continued encouragement of Hashimoto's efforts hurts the national forces of opposition. As long as Hashimoto and his acolytes are in operation, the Kansai region has its own, home-grown opposition to the LDP. With the Ishin no Kai and the LDP slugging it out, perhaps good-naturedly (if Abe invests the time to bring the two sides to a truce) in the Kansai, the DPJ will have forego making a play for the Kansai's rich harvest of seats, making the path to becoming a worthwhile national challenger to the LDP all the harder. Later - This morning's NHK news has zero reports on the Osaka elections results. Granted, today is a national holiday, meaning that NHK's newscasts are abbreviated. However, even the commercial networks seem to be downplaying the story -- demonstrating that the post-Koizumi, post-DPJ erosion of the image of politics and politicians continues. While terrible news for governance in Japan, the continued decline of the salience of politics is great news for those infatuated with/dependent upon the façade of stability. I hope to be on Al-Jazeera later today, talking about the Park-Abe-Li trilateral summit. 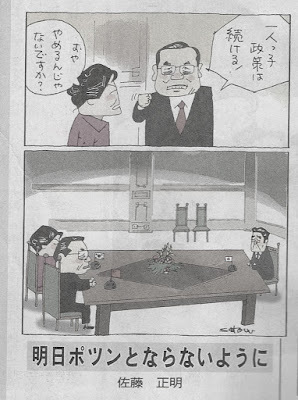 In the meanwhile, the latest* from Japan's master of political cartoons, Sato Masaaki, on the reception Mr. Abe may receive when he meets with the other two leaders in Seoul. Li Keqiang: "The One Child All By His Lonesome" Policy will continue! Park Geun-hye: You mean the "One Child Policy"? Aren't you discontinuing that? Tomorrow, try to not end up left out. * Original image in color. Color removed to avoid copyright infringement. For a government that has until this point claimed the moral high ground in disputes, calling for a strict adherence to international law (Link) the Abe administration claim that the ICJ does not have jurisdiction anymore over research whaling is mind-blowing. Taking disputes to the ICJ is a consensual process: both states accede adjudication willingly, under the presumption that whatever the Court's decision will be, the states will abide by it. Unsurprisingly, the Australian Government is stunned by the GOJ's move (Link 1 and Link 2). What can the government of Australia do? Rescind the just agreed-upon visit by the Prime Minister (Link)? Downgrade security coordination? Mess with the submarine acquisition? 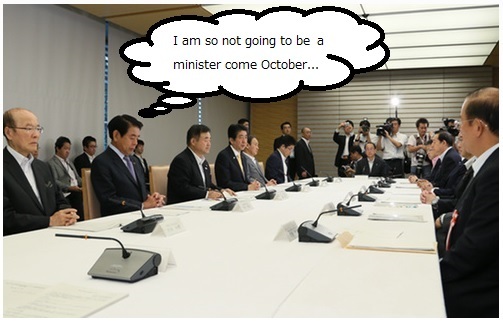 As for the Abe Government/MOFA, what the heck do they think they are doing? Is not strict adherence to the rule of law the cudgel of choice for bashing the People's Republic of China for that country's actions in the East China and South China Seas? 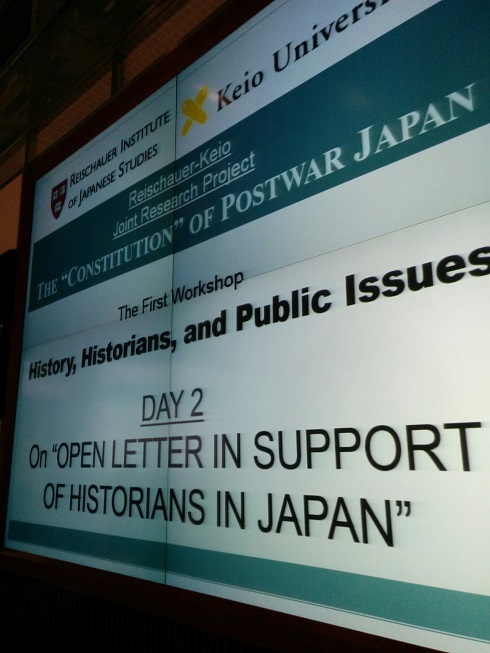 Or does the rule of law only apply to territorial disputes (a possible reading of Abe's address to the U.S. Congress, cited above)? - Party time at the party headquarters! Masterful is the Liberal Democratic Party's latest gambit on a two-tiered system for the legally-mandated rise in the consumption tax from 8% to 10% on 1 April 2017: have the list of those items eligible for a lower tax rate expand incrementally (Link - J). Absolutely gob-smacking brilliant! 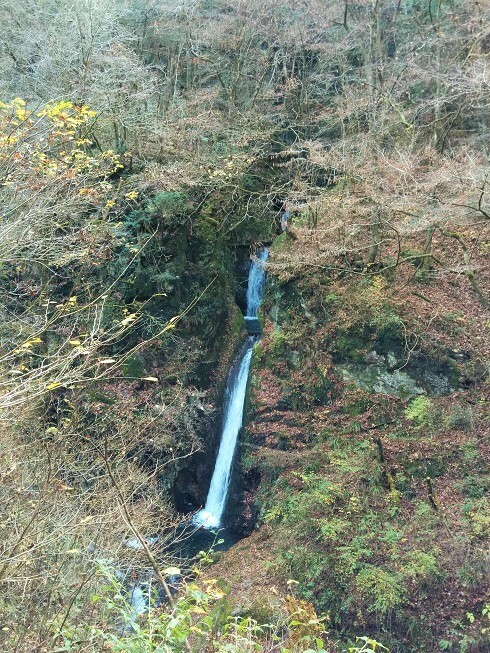 Have a tiny list of items at the outset, simplifying the passage of the necessary adjustment legislation through the upcoming 2016 Regular Session of the Diet, allowing the coalition partner Komeito to keep its promises of a lower tax rate for household necessities made to the Married Women's Division of the Sokka Gakkai. Include the new, lower tax rate as a part of the package of goodies coalition candidates can crow about in their House of Councillors campaigns next summer. Then, from here until eternity, have representatives of companies and industrial & consumer groups lounging around in the hallways of the LDP, begging for inclusion of their items in the list of "household necessities." 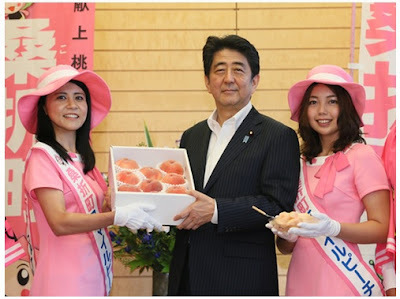 I have worried that Abe can reverse himself, that in the giddy atmosphere of Abe's unchallenged reelection as president of the LDP and the continuing lack of public interest in the opposition parties he might pay a visit to Yasukuni out of sheer adolescent exhilaration. 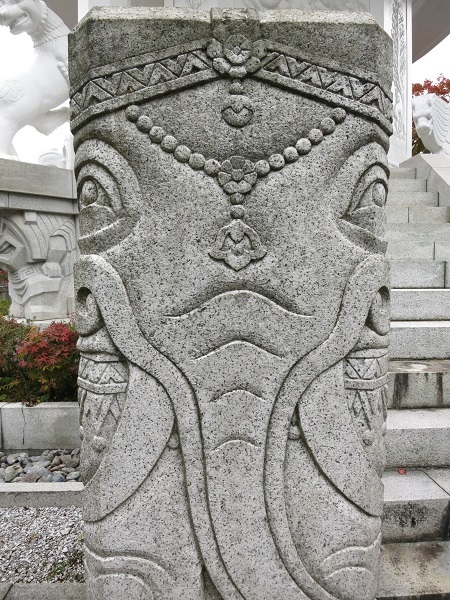 My worries were considerably lessened by Hagi'uda Ko'ichi's declaration to the Nikkei that in the name of regional peace Abe need not go to Yasukuni (Link). If Hagi'uda, the Yasukuni bagman (Link) whom I have characterized as Abe's "Id" (in the Freudian sense, with Abe as the Ego and Suga as the Super-Ego) is now on board with Abe's avoiding Yasukuni in the interests of diplomacy, then the deal is pretty much done. Who got in the Cabinet first! Most of the time the push-off replies "No Comment" and "I will not dignify that question with an answer" are the politician's friends. There are some questions, though, which a politician has to answer with a direct "Yes" or "No" and let the chips fall as they may. "Today we are not at a place where we should be talking of such things so I should like to forego responding to your question at this time." Unfortunately for Minister Takagi, the question being yelled at him at the Prime Minister's Residence was in regards certain allegations of misconduct of a rather peculiar kind. These allegations have been prominent in the headlines of the scandal sheets and the weekly magazines this week. "Minister Takagi, it is true you were arrested 30 years ago for breaking into a young woman's home and stealing her underwear?" Hope as one might, plead for delay as one might, there is no wiggle room here, so to speak. This was really a "Yes" or "No" moment for Takagi. By choosing to evade the question, he has instead opened the floodgates for what is a rising tide of ridicule. Will the brand new minister's increasingly likely resignation damage the Abe administration? No, not significantly. Will the resignation of a minister only 10 days after his installation increase pressure on Prime Minister Abe to reverse his present course and instead schedule an Extraordinary Diet Session for sometime in the last two months of this year? Possibly. Colonel Sato, despite being one of the Prime Minister's favorite Senators and invaluable in the campaign to push (literally, in the final showdown) the security legislation through the House of Councillors, was not rewarded for his service with a cabinet post. ...have taken another major project that will keep me from posting regularly. This time I will be hardly in evidence for just over a month. Inshallah. Too bad, really. With the end of the longest Diet extended session ever; Abe's reelection as president of the Liberal Democratic Party; new parties emerging out of yet another Hashimoto Toru's ego-driven pile up; an emerging knot of schooled protest cadres taking on the security legislation and ultra-right wing harassment; and the likelihood of a Cabinet Reshuffle in October, the tightly-wound world of Japanese politics is about to a little looser. Mitsubishi Real Estate has announced plans to construct a new office tower north of Tokyo Station. It will be the tallest building in Japan, surpassing the current record holder, the Abeno Harukas of Osaka, by a whopping 90 meters. The building will also be way, way taller than the longtime standard measure of bigness, Tokyo Tower. 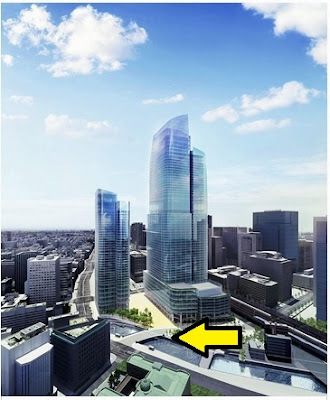 1) The artist's rendition has the Shuto Expressway de-elevated -- brought down to street level -- and Nihombashi, the central measuring point of Edo Japan, standing in the sunshine for the first time since 1963 (arrow in the above). If this change is for real and not just wishful thinking by the artist the project, despite its gargantuan proportions, will draw cheers. Getting rid of the elevated Shuto Expressway, built out over the river in order to avoid property acquisition issues, has been an essential dream of preservationists and urban specialists, not to mention Bank of Japan officials who have resented the Expressway's ruining of their neighborhood. 2) As a markets indicator, the announcement is a real downer. The near completion of giant buildings traditionally presages a crash in stock and real estate markets. The developer hopes to start construction of the building in 2023 with completion in fiscal year 2027. So mark your calendars. And watch your wallets. I am, as always, grateful. To be honest, I was reticent to contribute a comment. Politics in America is deeply unfunny. It is not clear from what springs Abe Shinzo's authority over matters as mundane (but crucial, given the current plan to hold the Olympics in August) as what kind of cooling system will be employed to keep spectators at the National Stadium feeling somewhat more comfortable. 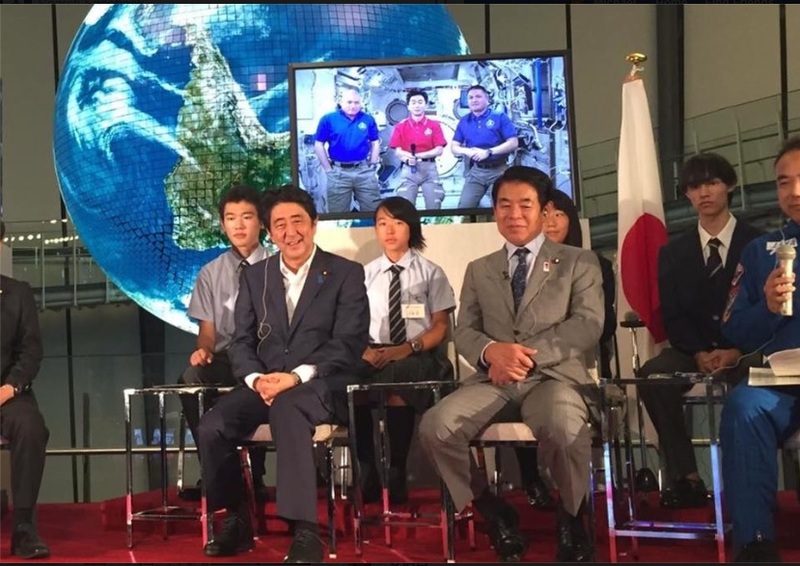 True Abe is the head of the government and the chairman of the government committee overseeing the Olympic effort. However, a chairmanship is not an executive role. These are the decisions that need to be made by the director-general of a bureaucratic organization. The committee should be merely rubber stamping the decision of this as yet unnamed director-general. So what is Abe doing here? Guess: making sure that when he hands off the premiership in 2018 in a precedent-shattering transfer of power (to Inada Tomomi) parachuting in as the savior of the floundering Tokyo 2020 organization, that there still will be a Tokyo 2020 organization for him to save. 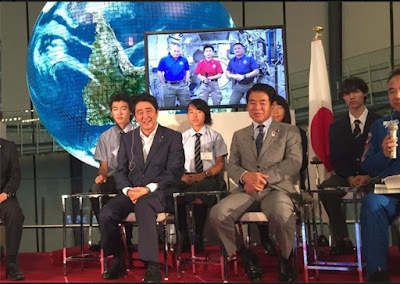 Abe decided to go all in in 2013, flying to Buenos Aires, delivering a speech in English in support of the Tokyo Olympic bid. At the time it seemed to many (including yours truly) that the Olympics were to be both an integral structural element and the capstone of the Abenomics economic revitalization program. Hence the befuddlement of many (including yours truly) at Abe's inexplicable appointment of a leadership team of superannuated, serial losers and misfits to guide the Olympics effort. What seems more likely now is that inevitable failure of the committee to guide the Olympics effort was not a bug but a feature, with the ages of the principals giving away the plot from the outset. Under a not-at-all implausible scenario it was Abe's intention to descend from the Olympian heights of the PM's office; supplant an ineffective and insipid Mori Yoshiro-led program; electrify the staff, volunteers and partners with his new, dynamic, experienced leadership (all brimming vim and vigor); and with only seconds to spare, lead Tokyo to host an Olympics putting all previous and future Olympics to shame. Only, of course, having put a band of self-important stuffed shirts whose only real daytime activity should be a round of golf in charge of a modern Olympics imploded far sooner than Abe could have dreamed. Perhaps he thought that his back would be covered by charter member of the Friends of Abe: Minister of Education, Culure, Sports, Science and Technology Shimomura Hakubun (seen musing above at the meeting of the steering committee for the new National Stadium). If so, Abe seriously misread his revisionist co-conspirator: Shimomura, who lifted himself out of dire poverty through academic scholarships, actually cares about education – and nothing else. 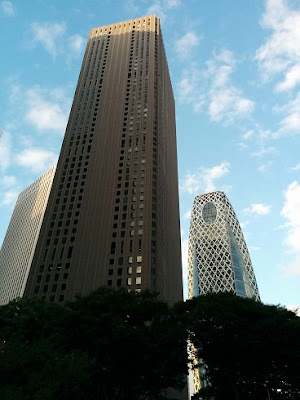 So bereft of direction was the structure Abe put into place that it had to be Abe, not the committee or Minister Shimomura, who had to pull the plug on the gargantuan Zara Hadid-designed Bicycle Helmet. It is Abe who is making changes to the design specifications for the next attempt. One does not have to read the analysis of the new stadium plan, though there is a lot of juicy stuff coming out, to know that even with Abe's direct intervention, the Olympics effort is ensnared in a web of cross-purposes. One only has to read the official government description of Friday's meeting of the National Stadium committee. According to the Prime Minister's Residence website, those deciding on the new design for the new National Stadium will "undertake their investigation bending an ear to the voices of the citizens and the athletes." As comedian Chris Rock would say, the Kantei wants the committee to get credit for activities any other committee knows it is just supposed to do. Under the rubric of "putting the athletes first" the committee will, and I am not making this up, "as a principle limit the functions of the national stadium to what is necessary to put on the sporting events themselves." How is building a structure that does the least possible and still be called an Olympics venue become "putting the athletes first"? Was a design for a structure in which Olympic events cannot be held one of the alternatives? Then there the little matter of the design itself. The committee promises, and again I am not making this up, to "simultaneously reflect international universal design, Japaneseness and other such attributes." Mark this still a catastrophe-in-progress. What would save this situation would be an open, national competition, with a young unknown architect or designer offering a simple, spare and elegant design (with an impact the lines of Maya Lin's design for the Vietnam War memorial in Washington DC with its legion of imitators, including Okinawa's "Cornerstone of Peace") bailing out Abe and his cronies from the fiasco they have spawned. The narrative of the Tokyo 2020 Olympics being a citizen's Olympics could then be resurrected. No, I am not hopeful. Original image courtesy: Prime Minister's Residence. About three weeks ago Timothy Langley and I had a long YouTube conversation about the implications of the Wikileaks release of July 31 (Link). The release itself featured rather innocuous information regarding Japanese trade and climate change thinking in 2007. What was stunning was the information demonstrated that the United States' National Security Agency was intercepting, translating and then disseminating the transcripts of the telephone calls of Japanese government officials in Tokyo. At that time of our conversation Mr. Langley told me that despite efforts of the current governments to downplay the significance of this spying, the story was not going away. TOKYO—Prime Minister Shinzo Abe on Wednesday asked U.S. President Barack Obama to investigate alleged spying by the National Security Agency on the Japanese government and companies, Mr. Abe’s spokesman said. It is a rare instance where the United States feels a need to express its regrets to a leader of Japan. Abe, however, has received an apology of sorts (Mr. Abe now knows what it is like to hear "Regret" when what one wants to hear is "Sorry") both from U.S. Vice President Joe Biden (Link) and now from President Obama himself. During the recording of the podcast on August 7, I thought the issue with legs would be the hunt for the door openers. The extent and depth of the infiltration into the communications of government officials, particularly the extraordinary number of telephone numbers tapped inside Japan's Ministry of Finance, indicated full cooperation, either knowing or unknowing, of Japanese entities and individuals. My thought was that the current Abe administration would demand to know who allowed the NSA access to Japan's communications networks or even physically into the ministries and the Prime Minister's Residence, that these collaborators or dupes might be reprimanded or even punished. My thinking now, in light of Prime Minister Abe and President Obama having a conversation on a subject that should have been closed by the previous conversation with Vice President Biden, is that the prime minister has a much bigger worry on his mind. The Wikileaks release featured analyses of internal communications from Abe's first term in office. The list of high priority targets includes "EXEC SCY TO CHIEF CAB SCY" - the executive secretary to the chief cabinet secretary -- meaning that the U.S. was listening in on the calls made by the executive secretary of the person who is the operations command center of Japan's bureaucracy, the Cabinet and the Prime Minister's staff. Bad enough news for the alliance-- one has to have a serious attitude problem to dare tap such a nexus of power in a country that supports the U.S. in almost every instance (not to mention figures out how to pay for a lot of what the U.S. wants to do). The timing of the tapping activity and closeness to the center of the intercepts, however, raises a searing question for Abe: what, if not everything, the United States government knows and has shared about what transpired inside the Prime Minister's Residence in late July, August and early September, 2007. The facts that his Diet colleagues do not know. The facts that his supporters do not know. The sports newspapers and the weeklies accounts of Abe's last weeks in office in 2007 were pretty wild and woolly. Abe has been insulated from the repercussions of these "revelations," however, because everyone knows the sports newspapers and weeklies will print anything, no matter how implausible, misrepresented or just plain made up. But if the U.S. was listening in to the calls being made by Yosano's executive secretary, then some folks, maybe a lot of folks, might just know...the truth. Only semi-prophetic was I on Monday. While I did guess correctly that a close associate of the prime minister would claim the Abe administration's prudent stewardship of the Japanese economy was the reason for the sudden surge in the value of the yen, I missed guessing the identity of the perpetrator. I had hoped the claimant would be LDP Political Research Council Chair Inada Tomomi. Instead, it was the equally close Friend of Shinzo, Economic Revitalization Minister Amari Akira, who checked in with the fundamental stability claim (Link).